The remarkable true story of an amazing and loyal donkey during World War I. The true story of a small grey donkey called Murphy, chosen to be a trusty ‘ambulance’ during the bloody Gallipoli campaign in 1915. He carried wounded soldiers over the hilly,craggy terrain to the field hospital as the bombs and snipers’ bullets rained down. The donkey was recruited by Australian stretcher-bearer ‘Jack’ Simpson, who cared for his brave helper day and night. Murphy never gave up or complained; he worked to the point of exhaustion, saving hundreds of lives. 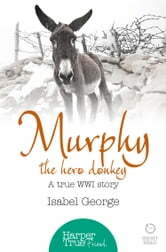 At the end of the battle, when the time came for the donkeys to be returned to Greece, the Australian ‘diggers’ were desperate to protect Murphy - he was one of them, he was a digger and a war hero. They fixed a brown luggage label to his harness, bearing his name and status, and hoped it would secure his safe passage home. This is an excellent book. It was a delight to read about the bravery of two soul- mates. Would recommend it.